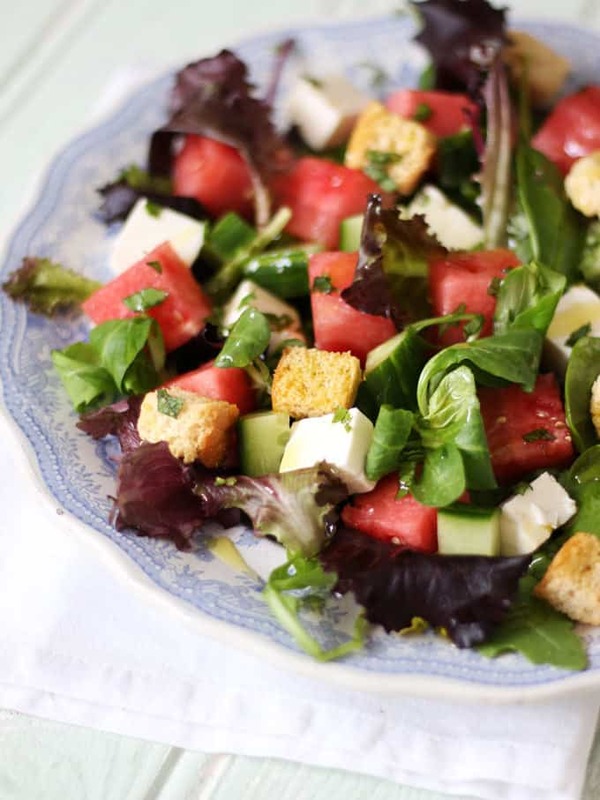 A watermelon feta salad with fresh mint dressing, baby leaves and rocket. A light and delicious summer salad, with added croutons to make a meal of it. Perfect for an al fresco lunch or dinner. It’s safe to say that I am not a natural born salad eater. My tendency has always been to carb loaded meals, a pile of mash or new potatoes over salad (I put it down to being a child of the 80s – white carbs all the way). As I get older though I’ve grown to love salad, a lighter option at lunch time or perfect for summer evenings where you can’t quite manage to summon the energy for the barbecue. I think it’s all in the making isn’t it? Once I realised that a salad can be so many different meals, I’ve become much more creative. I love a BLT salad, with crispy salty bacon and juicy tomatoes on top of leaves or a fajita salad, with spicy chicken and roasted peppers. This is my current favourite though. 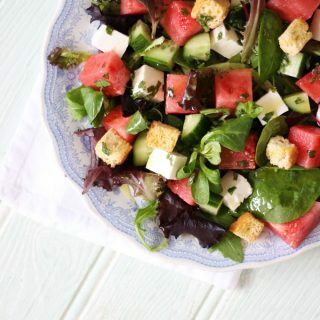 After our trip to Lemnos, the Greek island earlier this month, watermelon and feta memories are strong and my holiday blues resulted in this salad. The juicy watermelon, with peppery rocket, delicate leaves and salty feta are a winning combo. I’ve added some croutons to make it a full meal (because you know, white carbs). 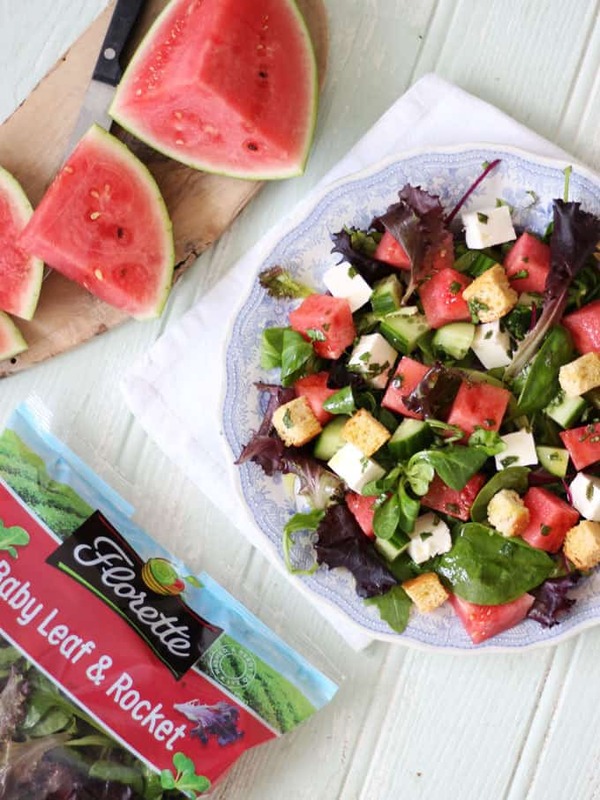 I used the Florette Baby Leaf and Rocket mix in this watermelon feta salad, it’s a selection of premium young leaves, nutty, peppery and earthy, it really compliments the other flavours and brings them all together. This salad bag is available from various supermarkets, and saves buying lots of lettuces or bags of leaves to make my own mix. This salad is definitely best served immediately as the melon is so juicy (the small watermelons from Waitrose seem to be particularly lush at the moment). 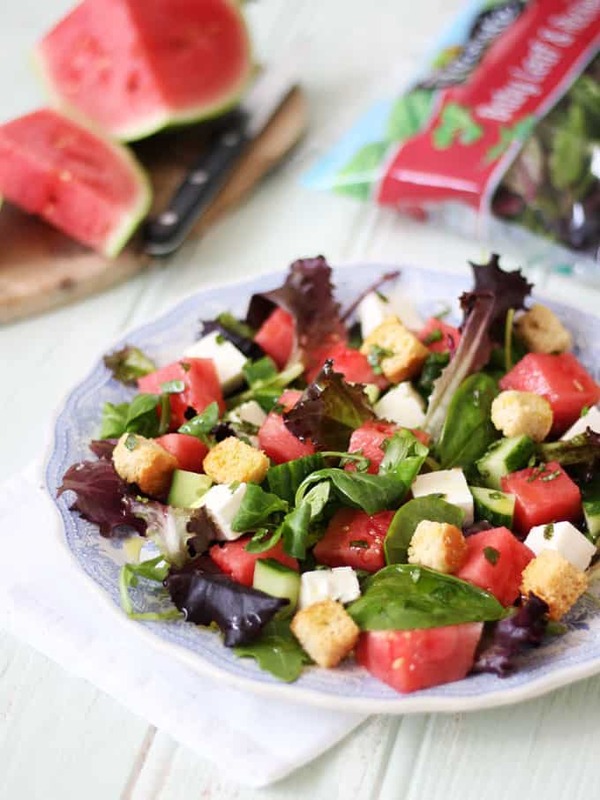 G&H are also watermelon OBSESSED right now so they are feeling the love for this salad too. 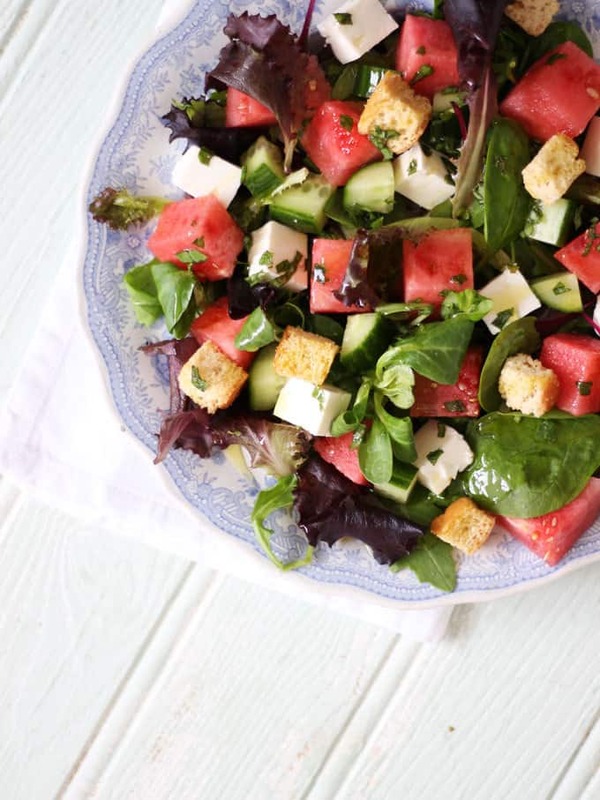 A lovely light summery salad with the refreshing watermelon. Split the bag of salad between two plates. Peel and chop the watermelon into large chunks and place on top. Chop the feta and cucumber into chunks and put on top. In a small jug or jam jar, mix the chopped mint, oil, vinegar and sea salt very well. Dress the watermelon feta salad at the very last minute. So, what’s your favourite salad? Any gems I’m missing out on?! Pin the Watermelon Feta Salad recipe for later..
Disclosure: This recipe was commissioned by Florette. As always, all opinions are truthful and I wouldn’t endorse a product I didn’t genuinely think was brilliant. This post contains affiliate links, this means that if you buy something after clicking through a link on this page, I will receive a very small commission at no cost to you.